In the 1970s Errol Walsh pioneered country-rock in Northern Ireland with bands like Rodeo, who were regulars on the Irish university circuit playing regularly at Queen’s, Trinity and Cork. He later moved to Tralee and joined Stagalee, a very popular Soul and Funk band who had a minor Irish hit record with ‘Give A Little Love’. Stagalee had numerous line ups and included such notable musicians as Honor Heffernan, Tommy Moore, James Delaney, Greg Boland, Dave McHale(RIP), Eoghan O’Neill, Maggie Riley among others. He then joined The Business playing a fairly eclectic mix of country, rock, blues and even a few Jimmy Cliff songs! The business had such luminaries as Pat Farrell, Jimmy Faulkner(RIP), Fran Breen, Don Baker, Tommy Moore, James Delaney, Davy Gaynor and played a legendary regular Sunday afternoon session in Slattery’s Bar on Capel Street. In the 80s he led some of England’s most critically acclaimed country bands like Tender Mercies, which also featured the legendary pedal steel player BJ Cole, and the Coyotes, who won the British Country Music Album of the Year. He formed Mucho Dinero with Ed Deane, Bob Clouter and Tex Comer and has written with Flaco Jimenez. 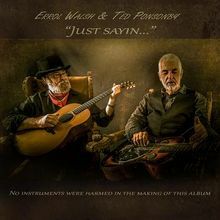 He has a new album out, ”Just Sayin” with his friend Ted Ponsonby, who is a stalwart of the Northern Irish music scene coming from a musical family from just outside Letterkenny and played with the Denver Showband, later forming Section One with Percy Robinson. The band later changed their name to The Rascals and since then Ted has gone on to become one of the top session musicians and producers in Ireland. He has played on sessions with artists such as Kieran Goss, Tommy Fleming, Brendan Quinn, Aoife Clancy, and Francis Black to name but a few. Although originally a rocker, Ted has changed his musical style considerably today and plays more country and traditional music around his native Letterkenny. Errol and Ted will be doing their first ever Dublin gigs to launch the CD on 24th March at the DC Club on Camden Row, and 25th March at Clontarf Yacht and Boat Club.